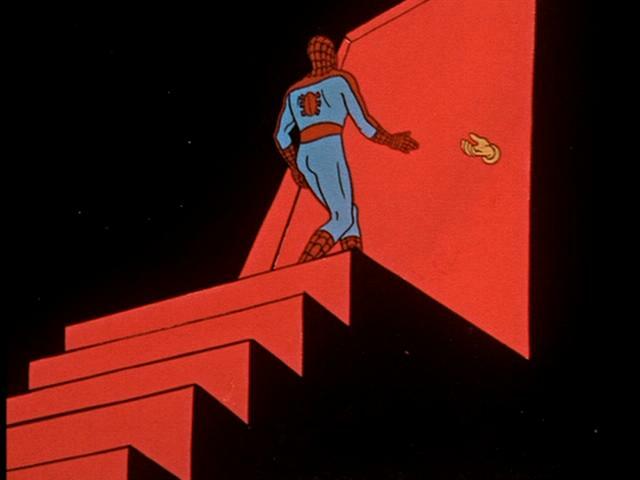 This was part of the Ralph Bakshi produced third season of the animated Spiderman serial (and was episode #74 overall). Straying far from Marvel continuity, Bakshi produced some off-kilter Spider-Man adventures during his tenure as producer. However, because of the ‘unsuitable’ themes of death and a hefty dose of Psychedelic Spatial queasiness, this episode – ‘Revolt in the Fifth Dimension’ – was the only one not to be broadcast with the original run of the series. As I have already stated, these shows were ‘non-canonical’ and in this episode there is a Villain who never appeared in the Spider-Man comic-books. The skeletal Infinata, the ruler of the ‘fifth dimension’ that Spider-Man encounters, is actually a character from ‘Rocket Robin Hood‘, a cartoon with a futuristic take on the Robin Hood legend. The reason Infinata is in a Spider-Man cartoon is simple – this episode is basically reused footage from the ‘Rocket Robin Hood’ episode ‘Dementia Five’. and then compare it with the Rocket Robin Hood original – ‘Dementia 5’!